Awarding the accomplishments of our students throughout the school year, and especially at the end of the year, is a wonderful way to build their confidence and celebrate their milestones. Super Teacher Worksheets offers an extensive collection of printable awards for elementary students, from pre-kindergarten through fifth grade. Our printable awards for older elementary students include academic certificates: reading and writing awards; math, social studies, and science awards; music awards; and computer skills awards. Teachers can also choose from a variety of character awards, such as kindness, good behavior, and responsibility. Do you want to recognize your students who have qualified for the merit role, honor role, or perfect attendance? 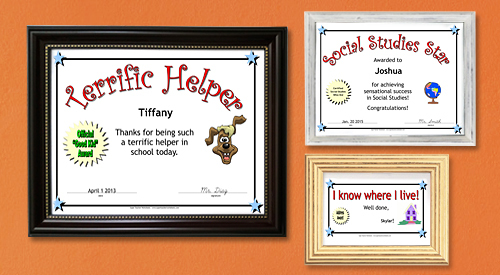 You can find these certificates in the Super Teacher Worksheets collection. The great thing about our collection of printable awards is that you can customize each PDF file by typing right on the certificate. Enter your student's name, your name, and the date on most certificates. The certificates look fantastic this way! Super Teacher Worksheets also has a large selection of award certificates for preschoolers and kindergarteners. These awards recognize the accomplishments of very young students in their day-to-day milestones. Now you can present unique awards to your little ones when they master important skills: writing their full name; tying their shoes; counting to one hundred; knowing the seven days of the week; reciting a parent's phone number; and more. Acknowledging these milestones in our students' development helps to instill self-esteem from an early age. Finally, remember to check out the Super Teacher Worksheets award certificates that kids can create themselves. These awards, for marvelous mothers, fantastic fathers, super special friends, and many more, are perfect for holidays, classroom team building, and creative projects. Empower your students to recognize the strengths in others. Whether you are looking to honor your students for attaining perfect attendance, mastering cursive, or improving their typing skills, Super Teacher Worksheets has printable awards for all your needs. Please post your ideas and feedback in the comments section below.